The Physics Bus – A mobile exhibition parked at the schools from Sept. 18 to 20 with more than two dozen science exhibits. It was a huge hit with the third-to-sixth-grade stu- dents from Hillside and FMS who participated. The Physics Bus was made possible through a PTSA grant, one of many special events held during the school year thanks to your contributions. Sing Us A Song – At Hillside we funded Sing Us A Song a Song for the 4th grade: Sing Us a Song has created a musical portrait of colonial times in NY for our students. They will learn how colonists lived, their forms of entertainment, their musical instruments, songs, hymns, anthems, and stories. Pocket Lab – At Hillside, we funded a PocketLab that will be used for physical science, weather and climate studies, and engineering projects. Bash the Trash – We have funded an assembly for Hillside to promote recycling, reducing, and reusing trash in our community. Flexible seating for two 4th grade classes – Recent research shows that the ability to move in an environment enhances learning, concentration, and attentiveness. Two 4th grade teachers asked for funding of NeoRok stools, Bungee chairs, and balance ball chairs. The PTSA gave them the funding they were looking for. The entire First Grade will have the opportunity to work with Marie-Louise Miller during their final unit, Fairy Tales. The entire 4th grade will get to take part in a dance project developed by RiverArts in which they focus on 3 different choreographers who have had an impact on history, Martha Graham, Jose Limon, and Georg Balanchine. This Grant will provide lunch to all of the participants of Westmunc 2016. Reading Shakespeare can be a daunting task for even the most avid reader. This Grant supports the reading of A Midsummer Night’s Dream in the eighth grade Language Arts curriculum with workshops conducted by the Hudson Valley Shakespeare Festival. The Hudson Valley Shakespeare Festival, whose mission is to “communicate the plays with energy, clarity and invention,” is dedicated to producing the plays of Shakespeare with a fresh, new, exciting outlook. A Cultural Arts Grant which brings the practice of Yoga to our middle school students for fitness and stress reduction. During all class periods there will be at least two certified yoga instructors as well as at least one physical education staff member. Every middle school student will have the opportunity to participate. This Grant is for the 250 K & 1st grade Hillside students. Lou DelBianco is an interactive storyteller who incorporates diversity and multicultural education in his performances using a variety of genres such as personal narrative, folktales, songs, poetry and dance. The Boys Varsity Soccer team has reached the State Final Four in Middletown, NY. This Grant provides a Fan Bus to what ended up being the final game. A joint project between the High School Creative Writing class and Director Consultant Rachel Wineberg. Students spent the first weeks writing plays while the Director held worships for those students that were interested in directing the plays. The directors learned to work with actors and how to direct. Plays were cast and rehearsal held. The plays were performed as readings and the audience was asked to give feedback for the writer’s development. The students held a performance for the public. This is a year-long activity, guided by artist-in-residence, Alison Marra. Alison will work with our 6, third grade classes on four projects, which will enhance their Social Studies Curriculum. This world-noted dance company will be coming to our High School for a presentation on Cuban Dance. A great intro for our upper level Spanish students and other interested students, especially those traveling to Cuba later this school year! On a monthly basis, a news consultant will work with each individual 3rd & 4th grade class (11 classes) to introduce and enhance their knowledge of the world through the study of current events—both nationally and internationally. Science and Social Studies topics of interest (often chosen by the children) will be presented, with the opportunity for discussion regarding relevance to their lives. Computer Coding Grant for the First Grade. Cultural Arts Grant for the 5th Grade Salsa Festival. Cultural Arts Grant, Bash the Trash, a program that uses recycled materials to make musical instruments. Brought News Producer Claudia Heitler in to third grade and 4th grades to explore current events in the classroom. Ms Heitler was a news producer and Matt Lauer’s booker/producer at NBC’s Today show . Over the past years as post office coordinators, Paula Higgins and Debbie Troop have worked hard to inspire children to write letters. They wrote a grant to bring the author Tim Young to Hillside. Tim is a well-known toy designer, illustrator, puppet maker and author of books such as “I’m Looking for a Dinosaur”. Tim created a short video for the kids to watch and then visited the school to share his books and tell the students about his life as a writer and illustrator. Technology Education Teacher Christopher Koeogh partnered with the Girls Inc’s “Made w/Code” program to inspire the FMS girls who are interested in computer code to design develop to real work problems. This Google developed the program to encourage young girls to explore their interest in technology and coding to help bridge the gender gap in that profession. Promote awareness of wildlife by maintaining the bird feeders in Hillside and providing all bird food. The English department supplemented the eight grade reading of “A Midsummer Night’s Dream” with workshops conducted by the Hudson Valley Shakespeare Festival. The workshops brought Shakespeare to life, enhancing the students’ understanding of the play’s language, immersed students in the interpretation of character and textual analysis and engaged students in interpretation theater activities. Actors visited classes early in the readings to discuss the text and later returned to work as consultants to help the student to apply and practice what they learned. In this four day residency every Hastings High School student took part in a yoga class during their 80 minute block for physical education. Each year the PTSA is pleased to provide grants to fund projects that enrich the learning experience for our students. The projects should supplement the curriculum by providing materials or resources not covered in the school budget. Whenever possible we ask that any outside artist or provider register with the BOCES program. What kinds of grants are there? Enrichment Grants are intended to help enrich the curriculum by trying something different, exposing students to outside presentations, or purchasing new materials or equipment. Last year these grants ran from about $180 to $3000. Cultural Arts Grants support hands-on workshops, artist residencies or assemblies in fine arts, music, dance, drama and creative writing, and generally benefit a large group of students. They are usually fewer in number and larger in amount than enrichment grants, and run from about $500 to $5000. Cultural Arts Grants are reviewed by a joint School District – PTSA Grant Committee. The Dr. John J. Russell Renaissance Grant is a single grant of $1,000 for an interdisciplinary project. Named in honor of Dr. John J. Russell, former Superintendent of Schools, the purpose of the grant is to support the academic, artistic and physical education and development of the whole student – the Renaissance student. 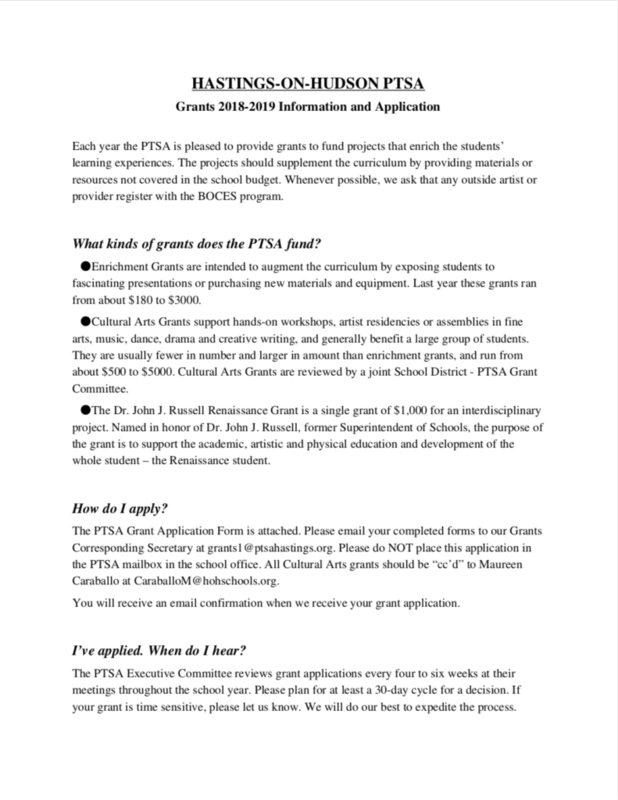 Download and complete the PTSA Grant Application Form (above). Please email your completed forms to our Grants Corresponding Secretary at grants1@ptsahastings.org. Please do NOT place this application in the PTSA mailbox in the school office. All Cultural Arts grants “cc’d” to Maureen Caraballo at CaraballoM@hohschoools.org. You will receive an email confirmation when we receive your grant application. The Hastings PTSA is a nonprofit, membership assoc that seeks to bring together the home, school and community on behalf of all children and youth.